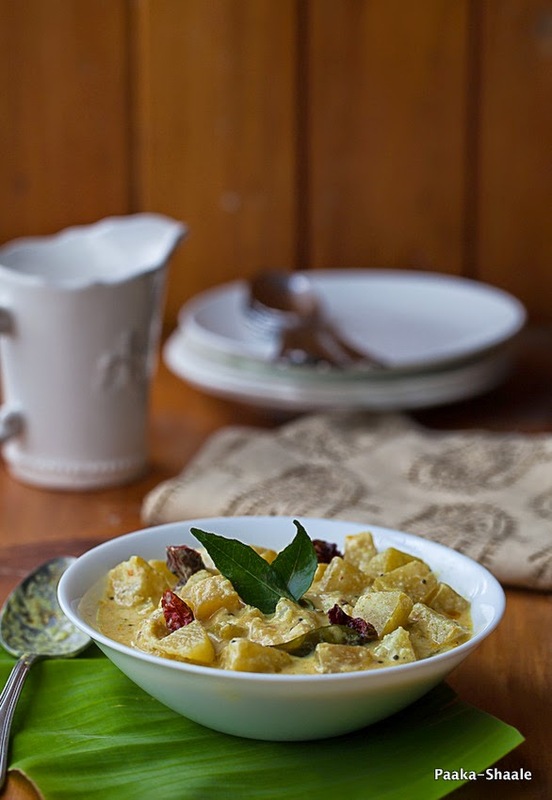 It's been a while since I posted a recipe for a curry/side dish. This recipe has been in my drafts for a long time. I have been procrastinating posting this recipe because I have not been able to capture this dish well. It took me five attempts to finally capture this dish. 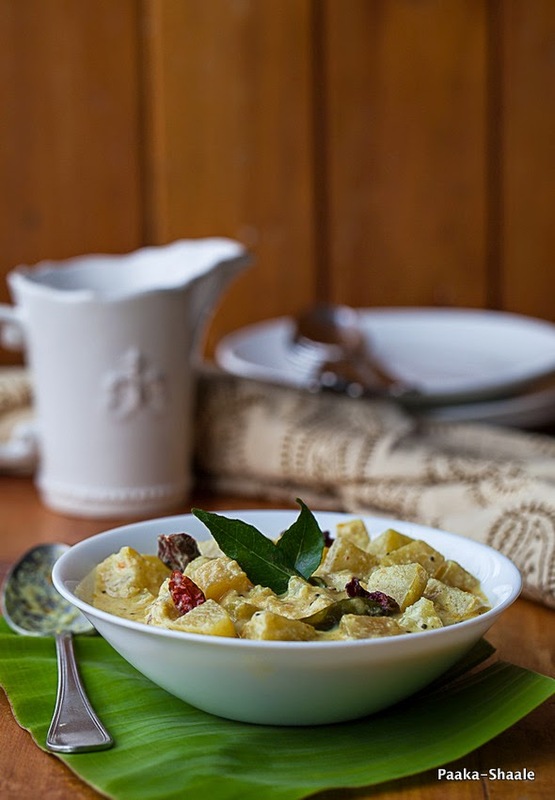 The Kalan is a yogurt based side dish that is a staple of all festivities in Kerala. 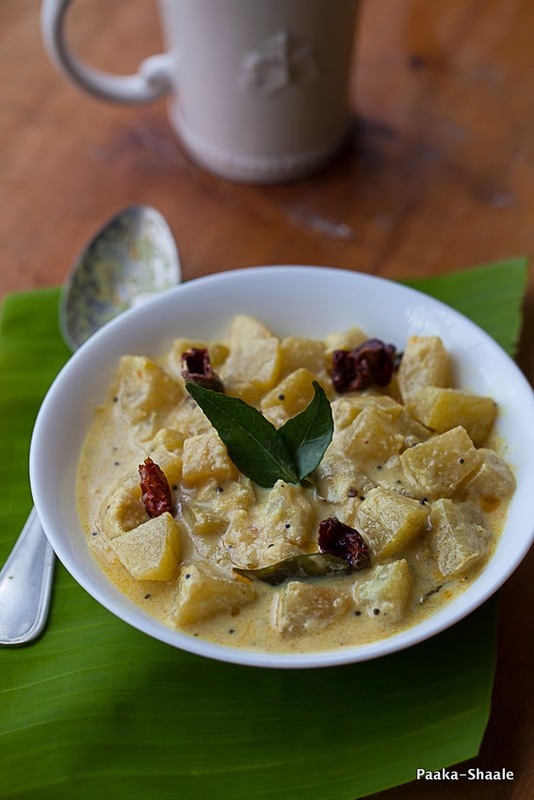 I was told that Kalan is a must during the Onam feast. This side dish is almost always prepared with either raw bananas or elephant yam. Since I had neither, I just decided to go ahead and make it with the Kohlarabi that was waiting to be used up. I must say that the dish turned out pretty good. 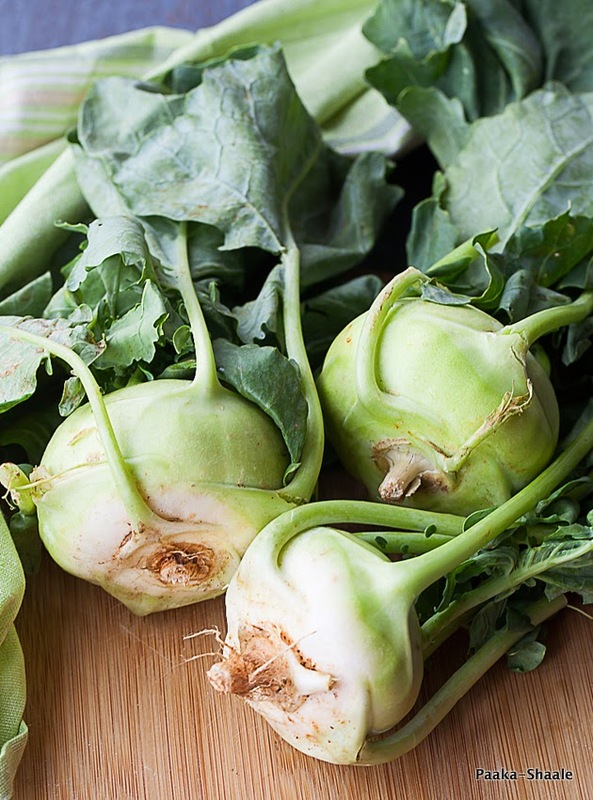 Kohlrabi or noolkol as we call it is a turnip like vegetable that can be eaten raw or cooked. Most of the times, I use this vegetable in Sambars. But my decision to use this vegetable in this yogurt based curry paid off. 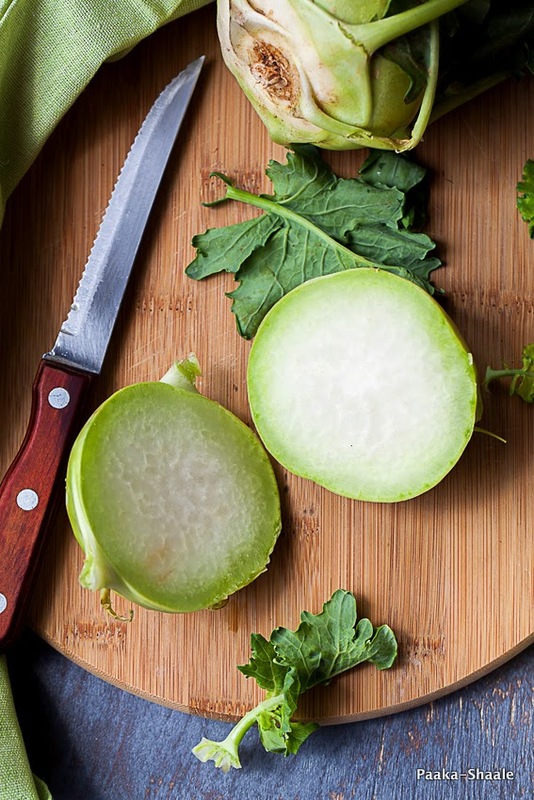 The kohlrabi is quite bland in taste. So the sour flavor of the yogurt and the spicy pepper compliments the bland vegetable beautifully making this curry quite irresistible. This recipe for the Kaalan was given to me by a friend from Dar. She had made this dish for our send off party before we left Dar. At first I thought she had served Majjige huli. But after tasting it, I realized it was a different dish altogether. I took to this slightly sour and peppery dish immediately and before I knew it, I was asking for a second helping. So if you are looking for a satvik side dish to be prepared during this festive season, then look no further. As this Kaalan will definitely fit the bill. Combine the chopped Kohlrabi along with salt, turmeric and pepper powder. Add one cup of water and cook till the Kohlrabi is cooked through and fork tender. Grind the coconut, cumin seeds and green chilies along with some water to a fine paste add add the paste to the cooked kohlrabi.Mix well and allow the mixture to simmer for five minutes. Stir in the whisked yogurt and the rice flour mixture, mix well and allow the mixture to simmer for five more minutes. Add the fenugreek powder at this stage and take off the heat. For the seasoning, Heat the coconut oil in a pan and add the mustard seeds. Once they crackle, add the curry leaves and the red chili pieces and fry till crisp. Add the asafetida, take of the heat and add the seasoning to the prepared Kaalan and serve hot with rice. 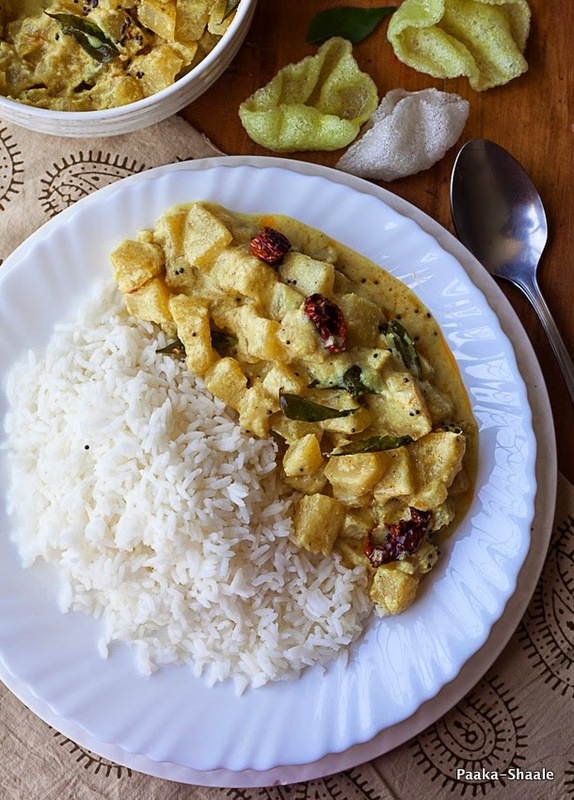 The rice flour is usually not added to this curry. 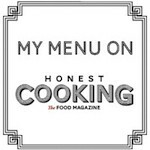 I chose to include rice flour because, I wanted the curry with a thick gravy like consistency. You can omit the rice flour if you want the curry to be slightly watery. Kalan looks super creamy,inviting and definitely delicious..Beautiful captures. Looks delicious! Beautiful presentation too..
Looks so inviting. I usually make sambhar from Kohlrab. Must try this. thanks! 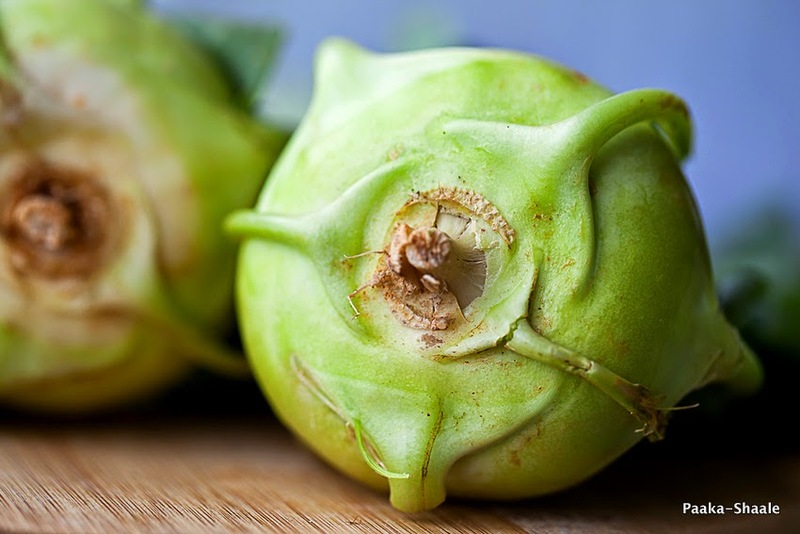 I love kohlrabi, it's common in Europe too. But I prefer it cooked and not raw. Hopefully kohlrabi will be in season soon again in goa. =) Thanks for sharing your recipe, looks like a treasure dish.